Linguatula serrata, also called the dog tongue worm, is not a helminth (i.e. a true worm), but a crustacean, like shrimps, crabs, etc. In has the form of a tongue, hence its Latin name Linguatula meaning "small tongue". It behaves very much like a worm. It infects the airways of dogs, occasionally cats, which act as final hosts, but also other domestic and wild animals (including cattle, sheep, etc.) and humans as intermediate hosts. It is found worldwide, mainly in warm regions with subtropical or temperate climate. In some endemic regions up to 50% of stray dogs can be infected. Linguatula arctica is a related species parasitic of reindeer in cold regions (e.g. Scandinavia). The disease caused by Linguatula serrata is called linguatulosis. Are dogs or cats infected with Linguatula serrata contagious for humans? YES. Mainly after ingesting contaminaed eggs shed with the pet's feces that contaminate the pet's environment. For additional information read the chapter on the life cycle below. Predilection site of adult Linguatula serrata is the nasopharynx, i.e. the nasal part of the pharynx. Adult female tongue worms reach up to 12 cm, males only 2 cm. They have a flattened body and the anterior end is wider than the tail. In contrast with parasitic worms, their body shows an external segmentation and is covered with an outer skeleton (as all crustaceans and arthropods) containing chitin. Adults fix themselves in the lining of the nasopharynx and feed on blood and body fluids of the host. The eggs have an ovoid shape, have a brownish to yellowish color, and measure about 70x90 micrometers. Linguatula serrata worms have a indirect life cycle, i.e. they useintermediate hosts (mainly herbivores) to complete development. But depending on how some hosts become infected, they can act as final hosts or as intermediate hosts. Other species have a direct life cycle, e.g. Linguatula arctica that infects reindeer. Female tongue worms lay hundreds of thousands of eggs. These eggs can be coughed out or swallowed and shed with the feces. If an intermediate host ingests them (e.g. cattle, sheep, camels, etc.) while grazing, the larvae hatch in their gut, burrow through the gut's wall and migrate to various organs (e.g. the liver, the lungs, the lymphatic nodes, occasionally the eyes), where the develop to nymphs and become encysted. When a final host eats an intermediate host or its remains, the cysts release the nymphs in the stomach, which migrate upwards to the nasopharynx through the pharynx. About 6 months later they complete development to adults and reproduce. Dogs and occasionally cats become infected after eating contaminated organs of infected intermediate hosts. In contrast with this, livestock become infected only after eating eggs that contaminate pastures or drinking water. In most cases infected dogs and cats show no clinical signs. However, massive infections can cause rhinitis (inflammation of he nose) and nasopharingitis with chronic sneezing and/or coughing, purulent nasal discharge, nose bleeding (epistaxis), etc. 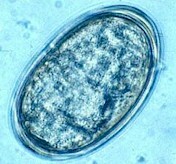 In livestock, most infections with nymphs are benign and remain asymptomatic. In case of infrequent massive infections clicnical signs may develop depending on the affected organs. Human infections are quite frequent in the Middle East region. Diagnosis in dogs and cats is based on the respiratory signs and can be confirmed through detection of eggs in the nasal discharge or in the feces. However, egg shedding is intermittent, which can lead to false negatives. Adult worms can be directly visualized in the nasopharynx through rhinoscopy or rhinotomy. Diagnosis in livestock is usually incidental, after X-rays that detect cysts or granulomas, during surgery for other reasons, after necropsy, etc. The best preventative measure in endemic regions consists in keeping dogs and cats away from raw innards of cattle, sheep, and other livestock, and to scavenge on potentially contaminated food (e.g. abattoir scraps). This will also diminish their output of Linguatula eggs into the environment, which is he major source of contamination for livestock and humans. To prevent human infections in endemic regions the basic hygienic measures have to be followed: frequent hand washing with soap; never eat uncooked innards or vegetables; avoid too close contacts with pets and quickly remove their droppings, etc. In Heavily infected dogs or cats surgical removal is often the only alternative. There are virtually no veterinary medicines approved for the control of Linguatula serrata in dogs, cats or livestock. There are a few reports showing that injectable ivermectin was effective against a related species, Linguatula arctica in reindeer. However, treatment of cattle, sheep or other livestock with parasiticides against tongue worms is usually not indicated, because they cause no economic damage. There are so far no true vaccines against Linguatula serrata. To learn more about vaccines against parasites of livestock and pets click here. Biological control of Linguatula serrata (i.e. using its natural enemies) is so far not feasible. So far there are no reports on resistance of Linguatula serrata to parasiticides. This means that if a parasiticide fails to achieve the expected efficacy, chance is very high that it was not due to resistance, but either the product was used incorrectly or in was unsuited for the control of Linguatula serrata. Incorrect use is the most frequent reason for failure of antiparasitic drugs. Ask your veterinary doctor! If available, follow more specific national or regional recommendations for Linguatula serrata control.